Congratulations to Dr. Pearl for receiving the 2012 Patients’ Choice Award! 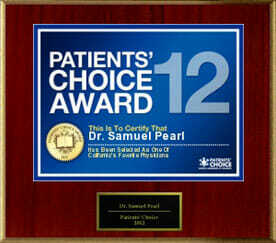 San Jose Plastic Surgeon Dr. Samuel Pearl has been given the honor of being recognized as a Patient’s Choice physician! The Patient’s Choice honor is determined by an online survey where patients provide feedback on various components of their experience with a doctor and at his or her office. Patients are asked by Vitals.com to rank the doctor on qualities such as bedside manner, spending enough time with the patients, making sound decisions that are in the best interest of the patients, attentiveness, diagnostic accuracy and effect treatment.